A study conducted by the National Institute of Health has concluded that giving (helping) to others and making a valid contribution to someone else’s life may actually prolong your own. It is understandable that this may not make sense initially. How is giving supposed to be better than receiving? To start off, giving makes you feel good. Seeing a smile on someone’s face could fill your heart with warmth. Or being there for someone who may be battling a life-threatening disease could get you thinking about your own life. Charity and generosity are valued traits in an individual. And giving does not necessarily mean money. It also does not require you to step down and let go of your power or sense of self. Even without any money involved, you can still give by extending your time, love, energy, and friendship to those in need. Give to help others grow or heal. Research has proved that giving affects the pleasure centers of the brain the same way as indulging in a great meal or a workout session does. It also improves physical activity by increasing muscle contraction by approximately 20%. This is especially good for old people. 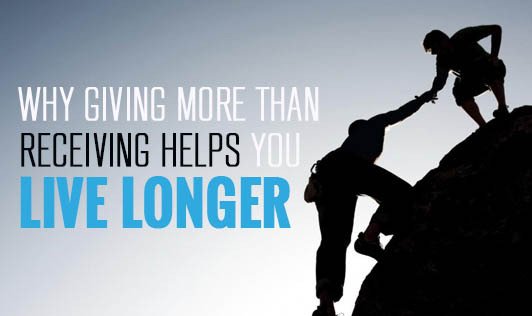 Moreover, giving lifts one’s spirits too and improves mental and emotional health. The results suggested that people who refused to extend help to others were twice as likely to die as those who did. Receiving from others, however had no long-standing effects on people. So start today if you are looking forward to a bright, happy, and long life. Extend a helping hand to your family members and then gradually move out of your circle and help others as well.